Since everyone is going modern and trendy by adopting a flatter, whiter and so-called simpler design, designers back at Instagram are also playing around trying a similar visual overhaul. If this gets approved, Instagram as we know it will no longer be alive. Mashable is now reporting that Instagram may be testing a complete redesign of its app, leaving the classic Polaroid design behind and adopting a more modern look, similar to many other apps. The screenshot reveals some noticeable changes, including a focus on icons. As you can spot in the screenshots shared below, the camera icon is no longer wrapped in a square and looks more like an actual camera. The activity icon that is currently a heart fitted inside a comment box, will simply be a heart, and the user profile icon which shows your profile picture is only a boring icon of a person in this new design. Recently, the photo and video sharing app has received some long awaited and hugely popular features, including support for multiple accounts and the ability to share 60-second videos. The new interface looks monochromatic and boring when compared to the classic current looks of the app. Every time we share the news of a new app going “flat,” many of our readers don’t approve of the minimal designs. However, please note that Instagram tests new design ideas with a handful of users, and most of the times these changes never make it to larger public. “We often test new experiences with a small percentage of the global community. 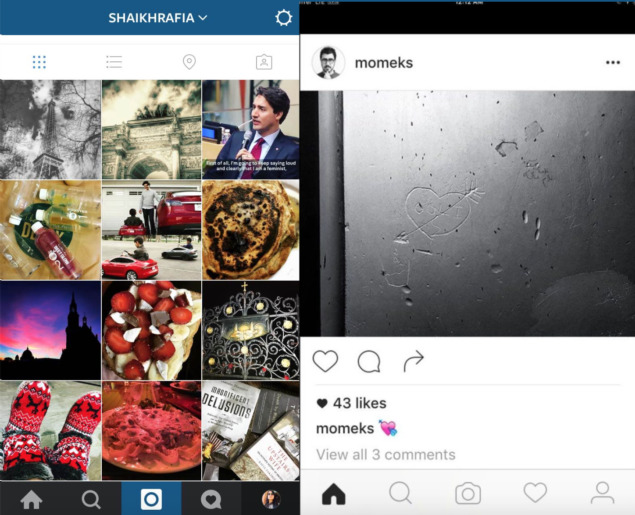 This is a design test only,” Instagram told Mashable.